ABS-CBN Lingkod Kapamilya Foundation, Inc. presents an art exhibit dubbed as “Dirty Watercolor” on May 24-26, 2016. The opening reception will be held on May 24, 2016, 6:00 pm at the Kirov Showroom, Rockwell Center. 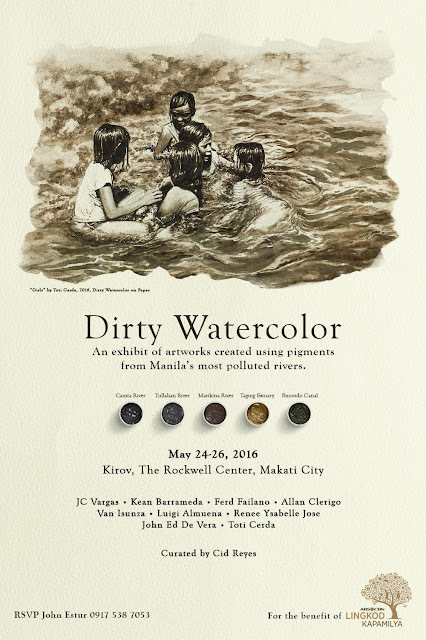 These paintings were created using pigments from Manila’s most polluted rivers and tributaries. The sample water was decontaminated and then concentrated in order to come up with the dirty watercolor they used to paint such beautiful art pieces. A project of TBWA/SMP and presented by ABS-CBN, the show is for the benefit of the ABS-CBN Lingkod Kapamilya Foundation, leading the cleaning up of our polluted rivers.